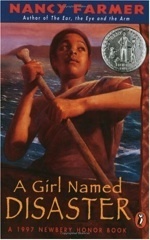 The book A Girl Named Disaster by Nancy Farmer is about an 11 year old girl that lives in a small African village in Mozambique. When her 12th birthday comes around she has to get married to a cruel man that has 3 wives. Her grandmother encourages her to escape the village to Zimbabwe. When the time comes she steals a man’s boat. The journey should only take about 2 days, instead it takes her many months to reach her destination because of the many problems that she runs into. Even though her mother got eaten by a leopard and her dad passed away, both of their spirits’ help her to get through these troubled times. This book sends a great message that children should never give up. As long as you believe in what you are doing and believe in yourself you can do anything. The WHS Library owns A Girl Named Disaster. 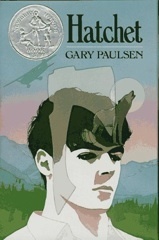 Hatchet is an exciting book about a boy named Brian (13 years old) whose parents are divorced. While on a trip to visit his father, Brian’s plane crashes in the wilderness, leaving him alone to survive only with the hatchet given to him by his mother. Injured, hungry, and without shelter, Brian must face the darkness of the forest and swarms of insects. How will Brian survive on his own? You will have to read it to find out. The WHS Library owns Hatchet in print and on audio. The book is about a boy named David who loves to go sailing with his uncle Owen in a boat called the frog. His uncle Owen with cancer and the cancer killed him a week after he went to the doctors. His uncle Owen’s last request was that the boat would go to David, also that David must sail to the middle of the ocean and scatter his ashes. While David sails out and scatters his uncles ashes and then a storm roared over the pacific that he did not expect, he has very little food and no flares or rescue devices. Read this book to find out what happens next. 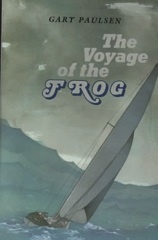 The WHS Library owns The Voyage of the Frog in print and audio. Mary is not like the other girls in the village. Everyone seems like clones of one another, they don’t seem to care why, where, and who they really are. There is a type of disease that has spread throughout the world, causing people to become a kind of monster, like a vampire. The people that have not been yet touched by the disease live in a village and are guarded by a fence from the “Unconsecrated.” No one in the village knows what these things that live in the forest are and no one really wants to find out. The Sisters of the village guard some kind of secret that no one outside their alliance knows about. All the people know is that they have to follow tradition. No one asks questions or dares to step foot near the fence. But Mary’s curiosity takes over and she needs to question everything around her. She puts herself in such a situation that all the people in the village are at risk and you either have to run for survival or be destroyed. 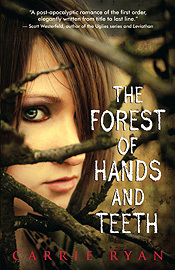 The WHS Library owns The Forest of Hands and Teeth. In retrospect I think spending all that time reading Lord of The Flies wasn’t such a great idea. While a nice little adventures novel by itself, it explains the basics of human psyche, as a bunch of kids are split up on the island, and go off murdering one another. While one of the children Jack, uses human fear and madness to control the rest. Sounds like something outta of a bad movie. That’s about how the novel goes, and it’ fairly mediocre in the syntax and plot. While there’s a random burst of interest in the book itself, it’s never really gonna keep you reading for prolonged periods of time, unless you have too. While I’ve had some people argue, that the book is deep in meaning, and that nouns in this book are used as metaphors, I don’t buy it, and now a days most people won’t too. (Woot, go South Park for teaching life lessons, welcome to the modern day boys and girls.) People need to stop looking for meaning in this book that’s not there, because in the end books are reviewed by what’s written not by what the reader think is written. To conclude it’s a mediocre book, with a mediocre plot, with a few mediocre subplots, with a mediocre cast, with mediocre syntax, in an amazing setting. 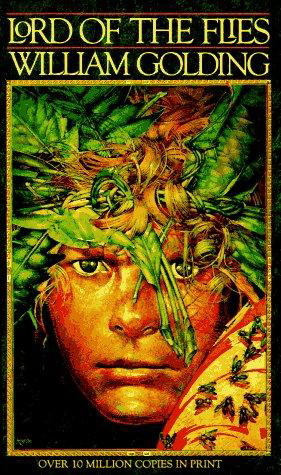 The WHS Library owns Lord of the Flies in print, audiobook, and video. 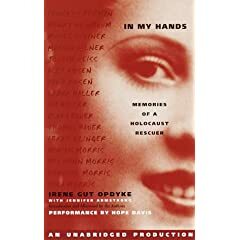 In My Hands is an autobiography by Irene Opdyke. The Opdykes are living in their town of Kozience, Poland peacefully. Fear is spreading by newspapers announcing the superior army power of Germany. All is safe for the people of Poland. Everyone knew that if either one of the countries made an act of war, the other wold counteract. This made all of the people of Europe feel safe until Germany and Russia made peace. Almost immediately, the horror from within the borders of Germany unleashes into Poland’s unprepared borders. This autobiography is about the entire journey that Irene must undertake. A simple Polish girl must quickly adapt into a Polish freedom fighter. Her difficult journey as a freedom fighter against the overwhelming occupation are obstacles that Irene must push aside to stay alive in Poland. When the Germans attack Poland, she is scattered from her family and is forced to work as a nurse in a German hospital. She escapes from place to place and the only thing that conceals her Polish heritage is her German name. Even being of German heritage, she must entertain the suspicious officers as she helps Jews escape behind their backs. This thrilling setting puts the reader into the horror of war and the lives of the patriots who risked their lives against overwhelming odds. This book brings you into Irene’s world of danger and shows how dangerous living in an occupied country can really be. The courage, loyalty, and survival make this book a must read.